Few in our Army would dispute the assertion that the 11th Armored Cavalry Regiment, the Opposing Force (OPFOR) at the National Training Center (NTC) is, very good at what they do. The commanders and soldiers in the OPFOR are seldom defeated in battle. For years, this unit has been the anvil upon which we have hammered and forged the combat power of our Army. Have you ever wondered how they do it? How does OPFOR develop and sustain its ability to fight and defeat its opponents in almost every battle at the National Training Center? How does the regiment, fighting with 1960s-1970s technology, routinely defeat brigade task forces equipped with the most modem weapon systems and technology our Army can provide? How can the regiment do it given the same soldiers, the same personnel turbulence (about 40 percent turnover each year), the same leader development challenges, and the oldest fighting equipment in the active Army? It’s my premise in this essay that these are not trivial questions, simply answered by the fact that the regiment has the opportunity to train and fight more frequently, or that the OPFOR knows the terrain. 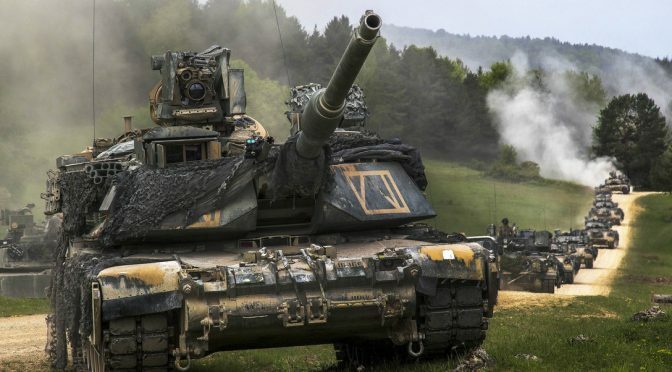 Just the opposite: I believe the answers to these questions are critically important to a force projection Army that is growing ever smaller, and they are absolutely key to achieving the full combat potential of Force XXI and the Army. Bottom line up front: It’s my conclusion, after fighting against it, observing it for 12 years and now commanding the OPFOR, that the fundamental reason this remarkable military organization is able to dominate its opponents is because the OPFOR has achieved the combat potential residing in its doctrine, organization, training methods, leaders, soldiers, and the capabilities of its equipment. The brigade task forces they oppose have not. Moreover, they cannot achieve their full combat potential, given existing conditions within our Army today. Understanding this premise, and the disparity, must begin with a discussion of how the OPFOR is organized. Fundamentally, the warfighting ability of the OPFOR stems from how it is organized. It is organized as a combined-arms team. It lives together as a combined-arms team, it trains as a combined-arms team, and it fights as a combined-arms team all the time. It is not a collection of units, thrown together on an ad hoc basis from various divisions and installations, who have never trained together, or a collection of units within a division which task organize and train infrequently as a brigade combat team. On the battlefield, habitual fighting, training and support relationships matter. They matter a lot in combat, and historically, the most combat effective organizations our Army has ever put on a battlefield share this organizational characteristic. Our military history is replete with examples. This comes as no surprise to those who know and understand what it takes to win in combat – teamwork, mutual trust and absolute confidence in every member of the team. To achieve these essential feelings, combat, combat support and combat service support units have to train and fight together as one team for long periods of time. Habitual team relationships foster incomparable teamwork, a prerequisite to success on any modern battlefield, where multiple units, with multiple capabilities, must be artfully integrated and employed simultaneously. A football analogy works well to describe this critical dynamic. In the great professional football teams, because they live together, train together and play together, every member of the team understands every other role and responsibility and every member knows the others’ capabilities and limitations. In every play (battle), every player has a specific task and purpose to achieve; he knows when and where his task must be achieved in order to set conditions for success. Equally important, he also understands what every other member of the team will do, when he will do it, and where he will do it. This common understanding develops an incredible sense of unity and purpose, and the most powerful effect of all, a common visualization of the play (battle) and how it will unfold. Each player sees how he fits in the big picture, thereby giving him a sense of purpose. Having a sense of purpose, and knowing your team is counting on you to do your job, produces a powerful motivation to succeed. Moreover, the plays executed by a professional team are a display of artful synchronization, achieved through constant, repetitive practice as a team – something completely unachievable by any other means. This same kind of teamwork is at the heart of the OPFOR’s performance, and historically, the performance of our best combat units. Habitual team organizations also foster mutual trust and confidence throughout the force. Nobody in combat is comfortable fighting with strangers, fighting with an ad hoc collection of units whose leadership and capabilities are not proven and known. Mutual trust and confidence are absolutely critical in combat. When a team lives together, trains together and fights together all the time, leaders and units get to know one another very well. They learn who they can count on, who can do the job. They learn who can pull their weight. They immediately recognize the others’ voices on the radio: they are talking to friends and comrades. They learn to trust one another, and from this trust comes an unshakable confidence. Though confidence is intangible, that’s what wins in combat, and that’s what brigade task forces are up against in the OPFOR at the NTC. It is a tremendous advantage. In contrast, the brigade task forces the OPFOR opposes each month are not, by Table of Organization and Equipment (TO&E), organized as combined-arms teams. Instead, they are a temporary or ad hoc collection of units from different divisions or installations, thrown together for training, who have not had the opportunity to train together or to train as one team at the frequency necessary to develop their full combat potential. They are strangers, trying to do their best but handicapped by a variety of conditions that do not foster or develop the kind of teamwork the OPFOR brings to the battlefield. Consequently, it’s like a neighborhood pick-up team stepping on the field with the Denver Broncos. In sum, the OPFOR provides us an important warfighting insight. Habitual combined-arms organizations (combined-arms teams that live together and train together permanently vs. temporarily) are fundamental to achieving the full combat potential of a force. But this is only a partial answer to the question. The training program and methods employed by the OPFOR to sustain proficiency in mission essential tasks are the catalysts for its success – the way you take potential and turn it into capability. Notably, these methods differ from the training methods employed by the brigade task forces they oppose. The regiment trains and adheres to proven doctrine, tactics, techniques, and procedures honed through years of trial and experience. Only three bedrock training manuals are used: U.S. Army Training and Doctrine Command (TRADOC) Pamphlet 350-16 on OPFOR Doctrine, the Regimental Tactical Standing Operating Procedures, and the Motorized Rifle Company Handbook. These three manuals serve as the blueprint for success. They establish clear performance standards and expectations. They foster simplicity in training, a common understanding of how we fight as a team and, consequently, an incomparable unity of effort during performance of combat missions. Every trooper learns how to fight from the pages of these three manuals. There is nothing fancy about how the OPFOR trains. Bottom line: The OPFOR stays focused on the fundamentals of warfighting at the tactical level of war. The entire training program is designed to sustain mastery of a few fundamental tasks and battle drills at each level of command – individual to regiment. For example, the first thing an OPFOR soldier or leader is taught is how to use terrain and all its features to accomplish the mission. Terrain walks are the bread and butter of the training program-low cost, but the most influential training tool in the kit bag. Learn how to see the terrain and how to use it, and you can’t be whipped. Motorized rifle, antitank, engineer, military intelligence, air defense and tank companies constantly practice only a handful of battle drills – those actions on the battlefield which assure dominance in the close, direct fire fight. Tank and mechanized infantry platoons continually practice set-move techniques, providing overwatch for one another as they bound from one intervisibility line to the next. Regimental battle staffs constantly practice a set of planning and wargaming drills which set near-perfect conditions for synchronization of the combined-arms teams. Blocking and tackling – the fundamentals – that’s what the regiment trains to do. By staying focused on the fundamentals, units are able to achieve the full capabilities and effectiveness of their combat systems on the battlefield. As to training methods, the OPFOR adheres religiously to the training doctrine and methods espoused in Anny Field Manual (FM) 25-10 I, Training the Force – the entire process. Individuals and units are trained and measured against established performance standards at every level. After-action reviews are always conducted, and if an individual or unit fails to meet the standards, they retrain and execute the task until standards are met, plain and simple. Time is always allocated for retraining. The regiment trains until standards are met all the time. It’s an ingrained habit. Moreover, and this is a critical point, the regiment trains to perform individual and mission-essential tasks at the frequency necessary to sustain performance standards. Nothing is more important to developing full combat potential in the kind of Army we have, than training soldiers, leaders and units at the frequency necessary to sustain performance standards. Why is that? Simple: Every unit in our Army faces two enemies every day, enemies which sap the combat potential of the force. First, as a result of how we man the Army, every year we turn over about 40 percent of the unit at every level. For the 11th Armored Cavalry Regiment, that’s about 1,000 new noncommissioned officers (NCOs) and soldiers we have to train and prepare to fight as members of the team. We’re continuously in the business of training new soldiers and leaders. Second, warfighting is an extremely complex business these days, with complex tasks to learn and master. And because we’re human, we forget how to do things as time goes by. The more complex the task, the sooner we forget how to do it. It follows, then, that the more complex the task, the more frequently you need to train. For these two reasons we’re constantly training new soldiers and we forget how to do things – the frequency of training individual, leader and unit tasks is absolutely critical to developing and sustaining full combat potential. In other words, get the frequency right, and you can sustain high levels of performance. Within our Army today, for a host of reasons – lack of money to train at the right frequency, lack of time, shortages of leaders and soldiers, installation support, and peacekeeping missions – brigade task forces, unlike the OPFOR, do not have the opportunity to train under tough, realistic field conditions at the frequency required to develop, much less sustain, their full combat potential at every level within the organization. It shows on the battlefields at NTC. Perhaps the most influential and discriminating difference between the OPFOR and the brigade task forces they fight is the leader certification program. Unlike the units they face, the OPFOR confirms that every soldier and every leader possesses the knowledge, skill and ability to perform his/her duties before they are permitted to fight with the regiment. Every soldier and leader is compelled to undergo a rigorous series of written exams, oral exams, terrain walks, apprenticeships and hands-on demonstrations of their knowledge, skill and ability before they are allowed to fight or lead. That’s right – every soldier and leader, from section to regimental level, is tested and must prove they can execute their individual and leader tasks. Platoon sergeants, platoon leaders, and company commanders must demonstrate their ability to execute their platoon and company march formations and battle drills, and to orchestrate fire support. The regimental chief of reconnaissance must demonstrate an absolute mastery of intelligence preparation of the battlefield. The regimental chief of staff must demonstrate his ability to conduct deliberate wargaming and set conditions for synchronization of the combined-arms teams. The regimental commander must demonstrate his ability to see the terrain and how to use it, see the enemy, see himself, and visualize how to shape his battlefield and effectively employ every capability of the combined-arms team to defeat his opponent. Only when the commander is assured of a leader’s tactical and technical competence, through testing and examination, is the subordinate leader permitted to serve in his position. This is a process foreign to the remainder of our Army, and in my opinion, at the root of the performance differential we continue to observe here at the NTC. It is a glaring disparity. The point of all this? These training methods, and the opportunity to train repetitively, are the way the OPFOR is able to achieve and sustain its full combat potential. Unfortunately, the conditions necessary to implement this proved training strategy and methodology, the training resources, and opportunity for the remainder of our Army do not exist. Units at home station do not have the money, time, and other resources necessary to train at the frequency required to develop and sustain proficiency in mission-essential tasks, platoon to brigade level. As an Army we do not train and confirm that battalion and brigade staff officers are competent to perform those duties before they assume their duties. For that matter, combined-arms battalion and brigade commanders are not required to prove and demonstrate a mastery of battle command skills and tactical competence before being placed in command. It is not, and has not been, a prerequisite for command selection. It shows at the NTC, year after year. To sum up, the OPFOR provides us another important warfighting insight: How you train soldiers, leaders and units, and the frequency of training, are key to achieving the full combat potential of a force. But again, this is only a partial answer to the questions. There is another important reason. Colonel Rosenberger is currently serving as Commander, 11th Armored Cavalry Regiment, Fort Irwin, CA. The above was originally published by the Association of the U.S. Army’s Institute for Land Warfare Studies as a part of its Landpower Essay Series. Read it in its original form here. I was at first confused by this article because its main point is about the need to be organized as a combined arms force. That is what the Army did with its Brigade Combat teams about 15 years ago. In many ways, the Army TO&Es are more combined arms than the Marine Corps. Then I learned from that Colonel Rosenberger commanded the 11th ACR from 1998 to 2000. The link to the original article shows it was published in 1999. All that said, the Opposing Force at NTC still regularly defeats the brigade combat teams that train against them even though they are now organized the way prescribed in the article. It is good that the Opposing Force usually prevails over the training force. That way the training force gets the most benefit. They learn by sad experience in a training situation. Still, the twin advantages of knowing the terrain and constant training contributes greatly to the Opposing Force’s success. Also, the Opposing Force is usually on the defensive trying to prevent the training force from accomplishing training objectives that the Opposing Force is very much aware. As the Marine Corps increases its force-on-force training, the Marine Corps should take in all relevant information about how to do it. I think it would be great if the Marine Corps supplied the Opposing Force for Army training and the Army providing the Opposing Force for Marine Corps force-on-force training. Both services could gain from opposing a thinking enemy that operates a bit differently. Great article but COL (R) Rosenberger hasn’t commanded the Regiment since the ’90s. COL Scott C. Woodward is the current BlackHorse6!